A Loreto classic! The Oasis is located at the south end of the Malecon (waterfront walk) and the mouth of the arroyo, with a broad, sandy beach just in front. They have quality dining on the patio overlooking the sea, and a popular swimming pool. 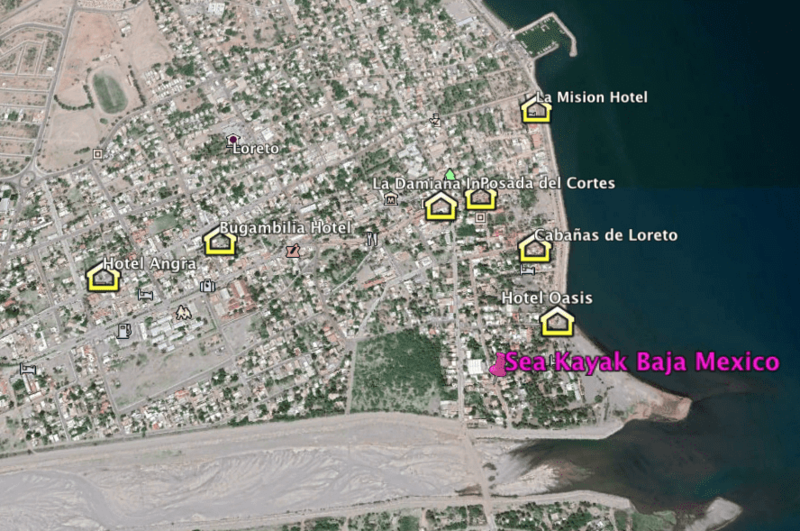 Hotel Oasis is located a block from the Sea Kayak Baja Mexico Expedition Base. Loreto’s utmost in luxury waterfront lodging, with a pool, bar, spa, restaurant and great views of either the mountains or the sea. It’s a block from the marina. 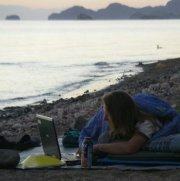 We can book the Hotel Mision for: $200 single or double with mountain view, or $250 single or double with ocean view. On Loreto’s central plaza, Posada de las Flores is classic Mexican elegance. They’ve been the Loreto luxury lodging for decades. There is a glass-bottom pool on the rooftop and a bar up there. Massages are available for a fee. 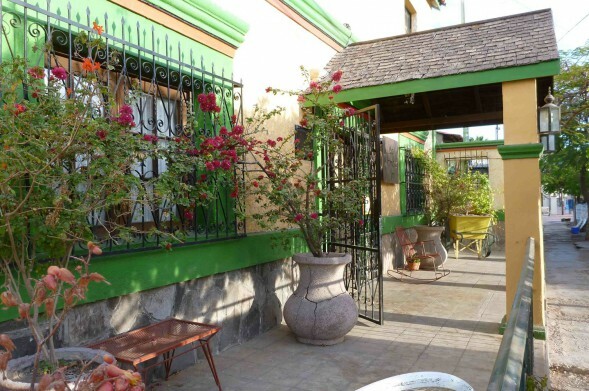 We can book the Posada de las Flores for: $155 single or double on second floor, or $240 single or double on top floor. Please no children under 12. Located in a quiet area half a block from the waterfront and a few short blocks from the Sea Kayak Baja Mexico Expedition Base, Las Cabanas has a pool, hot tub, lounge chairs, and a shaded BBQ/dining area. Internet. A delightfully relaxing atmosphere. Minimum of 2 consecutive nights per stay. A beautifully designed hotel with seven comfortable rooms, each one unique. There is a small gathering space on the ground level, and one on the rooftop with cool breezes and a sweet view. Continental breakfast included. A popular hotel among our guests! 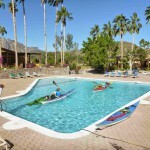 We are happy to book your stay at the Posada for: $110 single or $126 double. For your convenience we can book some choice Loreto hotels for you. Although we charge a standardized rate for this service, here are some differences in what the hotels charge. If you’d like to find yourself the best budget price, please book directly with them. It can sometimes take a bit of searching to find available space, but we are committed to finding you a satisfying stay in Loreto. We highly recommend any of the lodging on this page. We charge $85 single; $95 double. If a triple is available, it’s $105. Garden hotel with patio, community kitchen and a welcoming home-like feel. They have 7 unique rooms, internet, and hammocks in the shade. It’s in the center of town and close to everything. It gets teriffic reviews, and people love Debora and Gerardo. La Damiana is our first go-to when we’re booking a hotel. Close to downtown; an oasis in the midst. Simple, clean. Ana provides top service. Twelve rooms and wireless. Light breakfast included. Cozy 4-room hotel smartly renovated and under new management in 2019. Three of their rooms have a full bed and a twin. All rooms have microwave, fridge and coffee-maker. One of the smaller rooms has a kitchenette. The 4th room has 2 full beds and kitchenette. The rooms are situated around a small central courtyard with a fountain. Located near downtown on a quieter street. Owners Steve and Fani will greet you with a smile! A new and impeccably clean hotel close to downtown. It’s getting great reviews! All rooms have kitchenettes; suites have full kitchens. Ideal for families and couples. Inquire about suite prices. The proprietor Abel makes everyone feel at home. Internet, courtyard, small community kitchen. Private baths, like all of the hotels listed here. Located beside the mission in downtown, on a charming cobble street. All these hotels have secure storage for extra luggage during your kayak trip. For hotels in La Paz, please inquire. Tripui is 15 miles south of Loreto at Puerto Escondido. Restaurant, pool, internet. One mile desert walk to beach. Spectacular setting near the base of the Giganta mountains. Ideal base for doing day trips in kayak. This is also the base of operations for our courses because of its location and facilities.